One day in fifth grade when I’d exhausted all of the skinny, middle-grade books in our classroom library, my teacher handed me something much thicker, with a smaller font and harder words and a heavier subject matter. “Try this,” she said. 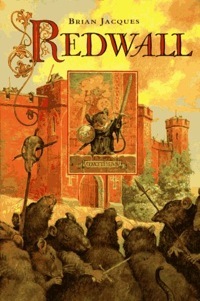 It was Brian Jacques’s Mossflower. I admit I struggled through the first half. There was a lot of plodding through deep snow, a lot of British dialects, a lot of long descriptive passages where not much happened – hard for a hyper kid to sit through. But the more I read, the more engaged I became, and the easier the reading went. It took me months to finish Mossflower. It took me days to finish the other four books in the series.